Review of "Echoes In A Shallow Sea"
Electronic music composer Mingo has been living in a dream of ambient soundscapes and other facets of experimental and drone music for over two decades. Mingo’s career has produced over ten albums along with radio appearances and live performances in and out of the Colorado area. Mingo’s latest release titled Echoes In A Shallow Sea is a brilliant display of the maestro’s genius and creative pulse. Echoes In A Shallow Sea is composed of eight ambient tracks. Mingo is able to transport listeners to distant lands and etheric worlds through a series of atmospheric collages that touch the human soul. Echoes In A Shallow Sea promotes a journey inward and through is sonic terrain we are able to travel to the stars. Dustland – As the title suggests, Dustland is a bare mural of sound and affords the listener an opportunity to empty their cups. This massage of instrumentation provides a means of release. for today’s anxieties. Lolite – A bit of a haunting track, Lolite is like the flicker of origin, the first light in the universe, unwinding and spiraling towards a new beginning in thought. Pantheon – Emerging from the depths of our consciousness in the melody are the bright shapes of the divine family. Truly, this sea of synthesized chords creates a charming measure that proves to be an oasis. Primordial – Visiting the dimension that exists beyond heaven is simply the indifference of how we perceive life versus the poetic patterns of reality. Forestland – An amazing track that perfectly displays the cinematic heights of Echoes In A Shallow Sea. As one of few tracks on this album that carries a sequence of percussion, Forestland marks its path by setting a stage of musical inspiration. Timelash – This is a very enthralling composition that is heightened by its seemingly whipping wind sounds and tribal drums. Shallow Sea – As one of the brighter compositions on the Echoes In A Shallow Sea album, Shallow Sea fits into a charming personification of the project’s overall sound. Melodic poetry can be heard in the language of instruments set forth in this track. Nebula – Nebula completes Mingo’s masterful work. The track’s return to a primordial state of consciousness that we encounter at the beginning of the album is perfectly in tune with the circle of life. Echoes In A Shallow Sea has some very deep messages that are both entertaining and hopeful. Mingo is able to let his gift as an electronic composer speak for itself. This album is truly a passionate voyage from a heartfelt space that is bound to touch and shape our outlook on life and music. On his last release, The Shaman, Mingo took his listeners into a vivid off the grid world barely touched since its ancient inhabitants occupied the territory. He carries that theme into his latest release with the equally gorgeous landscapes of The Ancients. This album conjures up vast open spaces and tribalism fused with an electro-ambient soundworld. The album starts off with the aptly titled trackAscension – featuring lush white noise layers to create a backdrop, while a slow-moving, electronic arpeggio, morphs and rises as if to bring you to a higher level to prepare you for the hour long aural journey. 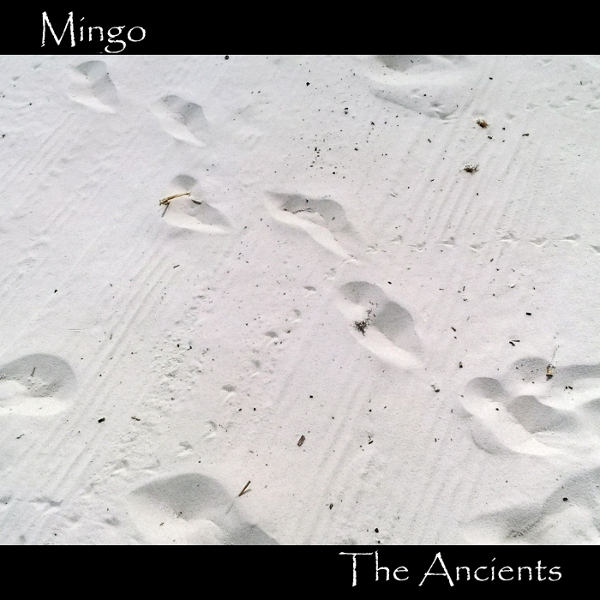 On the title track, The Ancients - soft strings and a warm analog “hum” guides you through most of this epic, nearly 13 minute long track, paying homage to the wisdom of the ancients. More electronic arpeggiation appears on this track, with an almost baroque feel to it at times. A trance-inducing percussion plays out in the third track Ritual. Airy pads and the hiss of shakers are combined with shell chimes, giving this track an earthy, organic feel. The next two tracks, From The Dust and In Ether have now fully engulfed the listener in a dark dream-state induced by this album. Dreamfield, is pure Berlin School pleasure, taking the listener to a slightly unexpected place as we reach the pinnacle of this journey. Next comes along the atmospheric track - Origin, and then we are carried into Relics, which introduces piano to the mix. Its lonely notes find their way through the foggy washes around it, a kind of dreamy meandering. We are then taken to the next epic and final track, The Hollowed. Airy whispering pads rise and fall, occasionally enhanced by electronic shimmers, eventually bringing us to the end of this sonic journey. Headphone listening is imperative to take in all that this album has to offer. The listener will become truly ensconced in the electro-ambient dream world that is The Ancients. It will take you some time to emerge back into reality and fully come out of the trance induced state that this album will no doubt put you in. My advice – don't resist, put the headphones back on and hit play one more time. When last we heard from Mingo, he had crossed over the musical river, away from his dark-edged, often tribally toned electronic musings to dabble–quite well, it must be said–in the shinier realms of New Age. With The Blue Star he returns to refine the sound that resonated with me on albums such as The Once and Future World and The Light That Bends. And while I have enjoyed everything I’ve heard from Mingo over the years, I do have to say that I prefer him on this side of the river. The Blue Star deals in curtains of light-grey shadow, the pulse of percussion mixed with suggestions of EDM, and wafts of slow pads both comforting and ominous. After the opening track speaks its relatively quiet peace with long bass chords and a pleasant-if-mildly-haunted piano, Mingo nudges us toward the darker side of things. Don’t worry, there’s plenty of twilight to see by, and the murky stuff is well in the distance. “Narvi” uses percussion to give us our first hint of a primitive influence—less tribal than just organically simple and marking a nascent rhythm while long pads drone beneath it. A tone like bass flute comes in to underscore it before Mingo pulls a smooth shift and goes toward more of a spacemusic motif courtesy of big, shining pads. Two tracks in the middle of the release are where we pick up some vibrancy and that nod to EDM. On “Amida” Mingo folds percussion in over windy drones and keeps easing the intensity upward. Soon enough it’s chugging and churning like an industrial thing, its rhythm made entirely of pulses. It will catch hold of you and pull you along for a few minutes. Then comes this album’s money shot: “Omega Point.” I cannot stop listening to this. It’s got some Berlin pedigree, it’s got an amped-up electro-pop attitude, it drones, it hums, it moves from potential to kinetic and you barely feel the acceleration. What you do feel is the joy of the thing. It’s reveling in its old-school garb and it’s doing it without a lot of effort. At its high point, what you’re listening to are two notes, maybe three, just repeating their phrase as the drone forms beneath it very slightly change key. I hear so many 80s echoes in this piece. Probably why I adore it so. And it’s worth repeating that it does it in a fantastically minimal style. That’s what strikes me about The Blue Star—how much Mingo is able to convey using what amounts to very little movement. There’s a deceptive simplicity at work; the elements alone don’t do much, if you listen closely. They stretch. They repeat themselves. They hold a note. And yet, when they’re layered, out comes this fantastic dynamic even though you know it’s still not doing much. “A Glimpse of Dawn” is a perfect example. It pulses and throbs, it sends spirals of electro-squibble off into the air now and then like it’s testing something, it sings softly to itself. It’s also got texture, an odd energy, and a weirdly compelling tone. The title track grows patiently as you listen, with fresh layers of sound cleaving off and rising without your really noticing. Each new bit feels like it’s been waiting all along. Repeat listens are a given with The Blue Star. It dovetails nicely into itself and each new listen seems to uncover one more secret. Its mix of space and primitive, dark and less dark, and its commitment to effective minimal structure has made it a personal favorite. Dive into this one immediately. Mingo is always worth listening to, and The Blue Star is him at his best. There’s a whole world of sound in the arrangements here, rich and in full measure. Just listen to OMEGA POINT and the title track, THE BLUE STAR and you’ll see what I mean. ZENO and NARVI have flavours of mystery and suspense riding in, bringing on something different and enticing. This album, consisting of eight instrumental tracks and almost an hour in length, has a space theme that suits the music perfectly, and brings to mind The Orb's ambient classic Adventures Beyond The Ultraworld. Opening track A Distant Moon sets an evocative mood, a single low end synth playing a repeated simple melody, eventually joined by a ghostly, haunting piano line and it's not difficult imagine yourself drifting through space as you listen. Mingo makes masterly use of atmospherics and sound effects that can be very effective in giving a sense of other-worldliness, like on the slow-building Narvi. The title track is seven minutes of blissed-out beauty orbiting somewhere near Betelgeuse, but the two epic tracks Omega Point and Under Spiral Skies were my favourites, both around the ten minute mark. They employ pulsing tribal percussion and rhythmic patterns to great effect, whilst A Glimpse Of Dawn and final track Zeno end the album on a suitably transcendent and mysterious note. Overall, this is a captivating and sonically fascinating album. Ambient music can take the listener on a journey and transport them in a way that perhaps no other genre of music can, and Mingo has become a seasoned practitioner of this art form. He has already built up a strong fanbase, and ambient/electronica lovers who are new to his work will find much to enjoy here. Once-dark artist Mingo continues his foray into a lighter, New Age-focused space on his new release, and it's obvious from the first moments that he's quite comfortable here. World flavors come through courtesy of a variety of strings, lilting flute, and blends of percussion. The grooves are laid-back and pleasant, and Mingo mixes in just the right amount of quieter ambient spaces to make the mix intriguing. "The Beach House" shows off the signature blend at play here, the aforementioned strings and flute laying down a clean, familiar melodic layer over a 1-2-3, bass-bass-snare beat and understated pads. Soothing, yet you'll find yourself tapping your toes along with that simple rhythm. Mingo hits his stride for me in the pairing of "Rays Through the Mist" and "Terra Globa." Here, a raga feel takes hold, spicing the air with Middle Eastern influences. Hand percussion and sharp, plucked strings lead the way as a bass drone wends hypnotically along. At just four minutes in length, "Rays." leaves me wanting more, but it also dovetails well with "Terra Globa." I actually catch myself whistling along with that track's repeating hook, and I get fully caught up in the twang of a sampled oud as the piece morphs into an ecstatic folk dance. The title track is a beautiful work, a deceptively simple pairing of twinkling keyboard runs over a blend of ambient pads-a nice reminder of the artist's past work, folded into the new. There's a similar feel in "Equilibrium Point," where clean, crystalline notes reminiscent of Steven Halpern's chakra-cleansing excursions ring out in patient runs over long strings. Close your eyes and focus your breath while this one plays. Another great release from Mingo, a fresh step in this latest part of his musical journey. Mingo is an outstanding electronic music composer with an interesting history, even more so by his 2012 album titled Kailasa, with 10 songs superbly acclimated to the variety of ambient new age music. Mingo made his mark by emerging into the techno scene of the early 1990's, exploring an ecosphere of electronica styles ranging from ambient, new age, space music, synthpop, and into the realm of experimental, futuristic avant-garde. Early success resulted in worldwide recognition and airtime on online radio stations like National Public Radio (NPR) program Hearts of Space, and one of the longest airing ambient, space music radio programs named Stars End. Mingo's inventive persona is unmistakable in Kailasa, an outstanding song collection aimed towards the ambient new age domain. The title to Mingo's latest release "Sky Over Sea", suggests that this is a musical journey, by sky and sea. That would be an understatement. While this album does take you to the sky and sea, it starts out on a launchpad and blasts you into the cosmos. You observe the planet below for awhile as you share the orbit with the moon. Then, you descend back to mother earth, gently splashing down into the ocean. And towards the end of the album, you gently drift over the horizon into a land known only to Mingo. While this album borrows in part from some of his previous releases, notably the ambient drifts of "The Once And Future World", and the tribal percussion from "Kailasa" - the first two tracks, "Candelabra Sky" and "The Beach House", are a welcoming departure from anything I've heard from Mingo's previous efforts. These first two tracks engage the listener with their hypnotic, electronic rhythm, while gentle ambient washes and tribalesque flute melodies fill out the rest of the track. It's as if you are observing the future and the past at the same time. And the rest of the album only gets better. Truly another great album from Mingo. If you are unfamiliar with his work - this is the one you want to get. Mingo is from USA and plays some kind of futuristic ambient/drone/space music, where beautiful or gruesome things are both hiding. Pleasant and dreadful at the same time, Mingo is surely not the common ambient music. Anybody who likes the sound of cold and ponderous notes should first check out Mingo then read this interesting interview with the man from behind the shadows. I searched the internet to find out what is "Mingo" and I have found this: “Mingo is an Iroquoian language native to the areas of western Pennsylvania, eastern Ohio and West Virginia. It is a seriously endangered language, with very few native speakers remaining.” Why have you chosen this name" Mingo" and how do you think the name Mingo associate with the music you play? I am frequently asked that question and I wish that I had a profound or interesting story to give. But the truth is, Mingo is just a last name – like VanHalen. I’ve heard of the reference to the Iroquois before, but in my case there is no relation. The album "The Once And Future World" is like a journey, where we can see and met beautiful but also hideous things, musically speaking: sensations of coldness/melancholy and lukewarm atmospheres are there too. What kind of impressions would you like to generate in the listener? You basically described the kinds of things I’d like people to think about when listening to my music. We need to consider all of these things, the things we perceive as being good or bad, pretty or ugly, and realize that they are all a natural part of the world we live in. Everything has its role or a reason to exist. And in a way it is all equally beautiful. Why do you try to give very minimal information about Mingo? I don't even know if Mingo is a one-man-project, or more a band with other people involved...Who/what is Mingo? Mingo is just me – a solo artist. I don’t intentionally try to be secretive about myself. But I also don’t think it’s necessary to be too forthcoming about myself either. I would just rather let the music speak for itself. If you don't mind I think that Mingo carries on what artists like Tangerine Dream or Brian Eno started decades ago. What do you think makes Mingo unique, or different from the other names in the ambient/drone/space style? I think the main differences between any two artists would be why or how someone creates. Or the process in which one creates. For example, you could walk into a bookstore and pick up two different books. On the surface they look the same and they may be written in the same language. But upon reading them you find that they contain two completely different stories. I think that’s the same way with music. There are all these different genres or styles. And while my music may be put in the same category as Eno or Steve Roach for example – I believe we all create this music for our own reasons and we each have different stories to tell. So, who were the artists with the biggest impact regarding your music and how did you reach to play this kind of music? As a kid, I listened to radio programs that featured ambient music and several musicians including Tangerine Dream, Steve Roach and Jean Michel Jarre, as well as many others. Throughout most of the 1990’s I was a rave party and club promoter. During this time I started creating trance music and started performing at parties throughout the Midwestern U.S. At the after parties the dj’s would spin ambient music and that renewed my interest in the type of music I was listening to years before. Eventually I started creating ambient music and became less involved in dance music. There are a few vocals on your album, but I don’t understand what are you singing, and lyrics aren’t available. Are there any real spoken words on the album? On “the once and future world” I only use synthesizers to create the sounds. But some of the sounds and effects do have a vocal quality to them. Occasionally I do sample voices and run them through several effects to in a sense de-humanize the sound. Do you have any musical training? Do you think it is good for a musician to learn musical theory or it is better to discover everything alone and to create his own style? Or maybe a combination of both? I had musical training from my child years through my late teens. And I am not sure how much of that I use currently. I think some of that training was more prevalent when I was in more traditional bands using guitars and so on and even when I was producing dance music. I’ve tried to break down some of those technical barriers when producing ambient music. I think this has allowed me to go into directions with my music that I may not have otherwise gone to if I had relied on my previous training. I’m sure it’s different for everyone who creates this type of music. In your opinion is there any piece of art (book, movie, etc.) which emanate similar feelings like your music? Personally do you feel close in mood to other pieces of art? I am also an abstract painter. I find that painting is the only other activity that I do that puts me in the same mindset as when I am performing ambient music. It seems that I always have a dozen things on my mind at any given time. But when I’m painting or creating music, it’s the only time when I am truly focused. If Mingo music could be a soundtrack and it would be up to you to decide, which movie’s soundtrack would be Mingo’s music? I once created a score for a short claymation film about an existential clay creature. I think that worked very well. Also, I’m a Wim Wender’s fan and I probably have an unhealthy obsession with the movie “Until the end of the world”. I don’t think my music would necessarily fit with the other music on that soundtrack, but there are parts where I think it would work. Wender’s is actually going to be in town talking about his latest film and so I’m hoping to slip him a cd. The kind of music you create is not a popular one (in the wide sense of the word), so I'm curious if you can make a living out of music, or do you have to maintain a “regular” job in order to survive? I don’t currently work a conventional “day job” as it were. I have a hard time trying to do anything creative while working an unrelated job that takes up all of my time. So as I mentioned before, I also paint which brings in extra money. I dabble in politics from time to time and I’ve also spent a considerable amount of time managing my personal investments. All these things together have allowed me to maintain a lifestyle where I have the time to do the things I feel I need to do. I am currently finding myself spending more time on the creating and promoting of my music in order for it to help perpetuate itself a bit more. How do you find your label Helmet Room, or how did they find you? Do you know the other artists from Helmet Room/Beta Lactam Records? What do you think of them? One of my favorite bands in my area has been a band by the name of Orbit Service. A few years ago I met the band and since then I have been the opening act for their shows. Our music blends in well together. Some of the members of Orbit Service started Helmet Room and asked me to sign on. My copy of "The Once and Future World" has no real booklet, only one page. I am wondering if my copy is a promo, or it’s the original copy which was intended to have minimal info? It sounds like you have the full release copy. The reason the packaging and information is so minimal is mainly for practical reasons. Since I have no real vocals in my music, there is no need to create a booklet to print the lyrics. And I see no real need to put much information about myself in the packaging. Again, I let the music speak for itself. If someone wants more information, they can always go to my website. And besides, most of my music sales come from internet downloads. I do like to have the cd artwork coincide with the music to some extent. But I think with the internet, the artwork and packaging is starting to become less important. I personally have not purchased a physical CD from a record store in almost two years. And I think it is a trend that we are going to see more and more. Who knows if there will even be CD’s still around in another 10 years or so. You also perform live. How many people are on stage when Mingo plays? Could you describe us how a Mingo show looks/sounds like? Do you use other elements (lights or projections) to extend the impact of the music? My last few shows I have performed strictly solo. I do like to collaborate and several times have performed live with a musician by the name of Shane Etter. He is currently involved with his new project called BOYFRIENDGIRLFRIEND, so we have not had time to work together lately. And also, I used to rely heavily on sequencers. When I had others on stage, this helped create a sense of unpredictability as I would not allow us to practice together until we actually performed live. But now I have added more analog synths and rarely use sequencers. This is all a part of the transition I have been going through as I get more involved in the free flowing ambient style and further away from the dance music I used to create. I do use a minimal amount of lighting, projections and effects when I perform. How many people came to a Mingo live show? And what kind of people are they? Over the last year or two, I have performed at shows where there have been several other bands on the same bill. While I think all of the different bands sounds have worked well together in the same arena, I have for the most part been the only ambient artist on the bill. So while several people have attended, it has been kind of a mixed crowd due to each band attracting their own audience. I think this is generally a good thing since it exposes people to other music they may not have intended to seek out. But at the performances where I am the only act or where only ambient music is featured – it draws an interesting crowd. It’s usually quite mellow, not a lot of talking going on during the performance and there is usually a good number of people who are meditating. I like doing both types of shows, but over the next year, with the exception of a festival I am performing at this summer, I am going to try to book smaller shows where maybe myself and one other ambient act will be performing. It’s all a part of my wanting to become more involved exclusively with ambient/space music. When I play the shows where a mix of other electronic genres of music are featured – I find myself not connecting with the music I am creating in the same way I do when it’s just an ambient/space show where the audience is in tuned with the music. I know you had a live performance with George & Caplin, whose music I admire very much. Personally what do you think of their music? I think they are very original and are creating a sound that no one else is exactly doing right now. On a personal level, that electronic experimental sound is the kind of sound I am attempting to disassociate myself from as I move more towards wanting to be fully ensconced in the ambient/space sound. Are you used to read the reviews about Mingo? What kid of response did you received? Do you think that people succeeded in understand your music? Anyway, does have Mingo a personal message, or are you just "doing music"? I find it interesting that since my music has no lyrics, the reviewers or listeners generally have the same reaction or generate similar ides about my music. I think that people are for the most part in tuned with the same things I am thinking as I am creating the music. I do not know if I have a message so much as I do have a philosophy I am attempting to relay in the sound. Sometimes when I’m listening to Mingo, I have visions of an apocalyptic world, pictures of the earth after a nuclear war, with agonizing humans. Do you share this thought? These are some of the ideas I was thinking about while recording “the once and future world”. I do not see these as necessarily being negative things. Maybe bad for humans, yes. But not for the world itself perhaps. Not to say that I’m anti humanity by any means. Do you think that humanity and the world we’re living in is closing to an end? Do you think the human race will disappear or you think that we will get used to the environmental changes (pollution, radiation, viruses)? I believe one of the most important things about our species is that we are and always have been able to adapt to the environment around us. Or more so, we shape it to meet our needs. And eventually I believe humans will create civilizations beyond our planet. So I am kind of mixed on this thought. On one hand I believe that we will push the limits of our environment to a point where our planet can no longer allow us to exist on it. Many people believe this is a bad thing, but I feel that this is just a natural progression of things. Once the earth expels us, something else will come along and the planet will have a long future without us. Just as it does now without dinosaurs and the other creatures that came before us. However, I also believe that humanity will survive, perhaps on other planets and the earth will long be forgotten as our home. Mingo's music has sometimes a "this is the end of everything" type of feeling and I would like to know personally what do you think of death and if you think death is the absolute end for us, humans, or is just the beginning of something else? I think most people see death as a sad thing. I’m certainly not obsessed with death and I fully intend to live a full life. However, I don’t think death is a bad thing or necessarily and end. Whether an individual dies, or all of humanity, or even the earth itself – life somewhere will continue to go on. It’s necessary. Besides, if we lived in a world without change and without unpredictability, would we really want to live in such a boring place? What is the concept behind “The Once and Future World”? What are your visions of the “Once World” and your visions of the “Future World’? I kind of touched on that in the previous question. While I was working on this CD, I was thinking about what was, what is currently happening and what will happen in the future long after humans have left this planet. The question of – will there be a future for mankind? And what does it look like? These are concepts I think about a lot. How do you think will be the future sound of music? This is a difficult question to answer but an interesting one. I think there are cycles in music where there are periods of extreme creativity and then periods of maintenance. For example, someone might come up with a new or interesting development in music. And then several others will try to emulate that sound and before you know it a new genre or music scene has been created. There are the innovators and then there are others who appreciate the new sound so much that they emulate it and make it their own. It’s a natural progression of things that can be found in everything be it music, clothing, automobiles or even an ideology for example. I think that computers and the internet are going to help change music in a more dramatic way as it has allowed more people to get involved and collaborate. Just as “bloggers” have changed the nature that we receive and share our information. The news and other information are not controlled by a sort of “media elite” or the government in some cases. Over the centuries, and especially over the past 100 years or so, more people have been able to get involved in creating music. And now with even more access, someone with just a passing interest in music can publish his or her work online for the whole world to hear. It’s a little more complicated than that still, but my point is – with more people getting involved, the amount of ideas is being created at a more rapid pace than in the past. And that can only be a good thing. It will be interesting to find out what we will be listening to in the near future. Any future projects which you would like to share with us? I am currently working on my next CD which I will hopefully have available by the latter half of this year. That's all, thank you for your time. Any words of wisdom in the end? Words of wisdom – well, I just believe that we should all spend more time doing the things we like to do. That’s what I’ve been trying to do anyway. This way, if the world does end – you’ll have no regrets. Thank you very much for your willingness to give an interview for Nucleus. First please tell me of yourself and your relations with music from the very beginning. Do you remember how you first got into music? As a child I took music lessons, but did not really get interested in music until my early teens. And I’m sure that’s a common story for many people. But what really turned me on was a radio station at the local university that featured electronic and experimental music. They played tracks from artists such as Kraftwerk and Jean Michel Jarre, as well as a lot of really obscure and experimental music that was coming out of the early 1980’s at that time. Then when I was in my mid teens, I received a small electronic keyboard as a gift. With that keyboard and a boom box I made my first recordings and eventually had a couple of my songs played on that radio station. I realized then that creating music was going to play a major role in my life. Can you tell me what bands and musicians were your personal influences? As I mentioned earlier, Jean Michel Jarre was an early influence. Other early influences were New Order and the Cocteau Twins, which I still listen to quite often. Basically, early on I was listening to and recording a lot of music that relied heavily on sequencers and orchestration. But then I discovered Steve Roach as well as other artists who could be classified as space musicians. That kind of free flowing, improvisational sound sent me into a different direction. And that’s where I find myself today. Do you find composing or improvising more rewarding? While composing and improvising are both used when I create a song, I find improvising more rewarding. It’s like going on a trip into uncharted territory. You know where you are starting, but are never certain where you’ll end up. For example, I know what synthesizers I’m going to use, effects processors and the first sounds I’m going to start out with. But as the session progresses, the sound constantly changes shape and takes unexpected turns. And because of this, I discover sonic textures that I may not have created had I not loosened the structure and removed the parameters that come with composing. How would you describe your music? My music has been described as sometimes dreamy and uplifting to cold and melancholy. And I feel that is accurate. I don’t necessarily intend to do this – but I find that my sound does capture a dynamic range of emotions. You would say that your last album, “The Once and Future World” was a lot more composed, a lot more structured that the previous material? As far as the CD as a whole, there is a common thread or structure throughout the recording. Where as my previous EP, “Strange Calibration” was more of a collection of tracks that had no relation to each other. Could you briefly explain the process of composing and recording this album? I started out with an improvising session that spanned several days. The foundation of each song stems from that session. Some of the songs remained in their original improvised form. I may have added some effects or changed the way I mixed the sounds, but little else was touched. With most of the tracks, I added percussion or a melody in order to change the dynamic of the song. Could you give me a brief description of each track? The first song, “Between the wave” – if fairly free flowing, with light drones and some staccato string sounds. “Time turned new” has a heavy droning sound that stems from some of my earliest ambient performances. There is also a tribal drum line throughout the track. And it ends with a distorted synth melody. “Hollow ascension” – I used a lot of reverb on this track to give the drums a large echo sound. There is a floating synth string sound throughout this track and there is a melody that sounds kind of like a piano, but I think it was actually a koto patch that I modified. I remember really enjoying making this track. “The infinite deep” – This track is basically a lot of percussion with some synth string swells and short deep drone bursts throughout. “Complex refraction” – Some have described the synth swells on this track as sounding similar to that of a whale’s song, which I think is a good description. There are also some light but deep drones throughout this track as well as a deep morphing staccato pattern. “Once and future world” – This is the most improvised song on the CD. It mainly consists of drones and layered textures blending throughout the track. It is also the longest song on the CD. While the other tracks are about 5 to 7 minutes in length, this is 15 minutes long. I find it easy to get lost into this song while listening to it and that was certainly the case while I was recording it. I felt it was important to keep this track at or near its original length, otherwise it would be like being awaken from a dream to soon. What non-musical things influence your musical style? Where I live very much influences my music. I live in downtown Denver, Colorado which is located near the mountains. When I look out my window I have a view of both the chaos of the city and the serenity of the mountains - this strange dichotomy. The city is constantly morphing, something is always being built or torn down and there’s all this unpredictability. Then there is this calm just before sunrise where the city seems to be in sync with the more natural outlying areas. The energy of my surroundings is certainly captured in many of my recordings. Is there any kind of “concept” behind your records? I’m fascinated by the fact that the earth occasionally wipes itself clean and essentially life on this planet has to start over. And it’s never quite the same as the cycle that came before it. And I try to put that thought into the context of how does that relate to human civilization. We think we’ve come a long way over our existence, but whatever kind of inventions we create, humanity hasn’t really changed. We face the same problems as our predecessors. And whatever we do while we’re on this planet, it’s inevitable that we too will face the end of the cycle before the planet gets cleansed once again. And I just wonder what may possibly come after us. Anyway, those kind of thoughts were on my mind while recording “The once and future world”. And I’m sure that’s a concept I’ll revisit on future recordings. Do you think your music has influenced someone? I know that there are people who use my CD to meditate to. And I have received comments from listeners that my music has had an effect on their mood, hopefully a positive one. So, I don’t know how much of an influence my music has, but it’s nice to know that my music has a place in people’s life. Are you involved in any other band or project? Occasionally I do collaborations with other musicians and hope to do more of that in the future. And apart from space music, I have created more experimental recordings, but have no immediate plans to release any of those tracks. What kind of role has the Internet regarding music these days? How do you think the internet has affected the ambient/space music scene? As with all genres of music, the internet has allowed more accessibility to recordings and the artists. But I feel this is even more so the case with ambient music. When I first started listening to this music, it was difficult to find any recordings and it’s still rare to find a lot of ambient and space music on the record store shelves, where this is not so much the case with rock or hip hop for example. Which musical style, direction, composer, band is important for you at present? As far as ambient/space, I find myself seeking out music from Red Shift as well as another Denver artist, Numina. And I wouldn’t necessarily classify this as ambient, but I really enjoy the recent Brian Eno release “Another day on earth”. I think he still pushes the boundaries. Also I’ve been listening to a lot of Felix Da Housecat. There’s this whole electro revival thing that’s been going on and he’s sort of been on the forefront of it. He’s venturing into some strange musical territory and I’m curious to find out where it’s all going. In closing, we'd like to thank you for this interview. Do you have any final words or requests? It’s actually been awhile since I wrapped up production on Once and future world and have already been working on new material that should be available in the fall of 2006. Dressed in a blue sweater, jeans and glasses, "Mingo" looks more like a Sunday school teacher than a guy who makes a living promoting underground activity. The 24-year-old Mingo, an Iowa City resident who wouldn't give his real name, promotes raves - secret all-night dance parties - phenomenon some teens and twentysomethings consider their lifestyle and some authorities hope to outlaw. At recent raves in Cedar Rapids and Davenport, enthusiasts described the gatherings as "festivals of peace" where electronic dance music throbs through speakers and fruit juice is poured instead of beer. "Everybody just acts like themselves, and they don't really care what other people think," said Nick Kasotakis, 20, a University of Iowa junior. "It's not a dating game or a mating game. You just go out there and dance and relax." Police and city councils tell a different story. Raves were banned in Des Moines in September when council members opposed teens staying out past 2 a.m. In October, Cedar Rapids police asked the City Council to turn down requests from local establishments to host raves, citing a shortage of law enforcement to patrol them. No action has been taken yet, but Assistant Chief David Johnson of the Cedar Rapids Police Department said late-night dancing is not the real problem. "We don't mind it per se," Johnson said. "The big thing is that these raves that I know about tend to have illegal drugs there - maybe not sanctioned by the promoter. Raves tend to attract individuals who are prone to using illegal drugs." Johnson said police were tipped that alcohol was being sold to minors at a small rave in October. When officers arrived they instead encountered someone illegally dispensing nitrous oxide - laughing gas - in balloons. He was arrested. Although raves have been portrayed as drug havens in TV shows such as "Beverly Hills, 90210," drugs are not as prevalent at Iowa parties, according to ravers. "We can keep 300 kids in a warehouse 3 to 6 in the morning," said Laura Schebler, 21, a University of Iowa senior who helped organize a Nov. 11 rave in Cedar Rapids that 200 attended. "It seems sort of silly to pass ordinances against them because we're in the same place all night not bothering anyone. Most of the people here are adults anyway. "At our parties there are no drugs," she said. "Raves have gotten negative publicity, but ours is clean. Some guys came drunk here tonight and we kicked them out." Watergun, the alias of a 20-year-old Davenport raver who would not give a name, said Iowa police worry needlessly. He said raves he attended while living in California usually had between 5,000 and 10,000 attending - much larger than one on Halloween in Davenport that attracted a few hundred ravers. "I basically got into going to all of them when I lived in San Diego, and now I'm starved for it," Watergun said. "It's the music - I just love it." MOST IOWANS still equate "rave" with a home perm or temper flare. Indeed, the parties have an underground following. They are advertised in fliers handed out at previous raves, by word-of-mouth, or on computer bulletin boards. Locations are disclosed on special hotlines on the night of the rave. Mingo, who promoted the Cedar Rapids rave, said he recently moved from Waterloo to Iowa City because of his frustration with finding space to rent for raves. "In Iowa it is almost impossible to find places," he explained. "The reason for that is police would literally go to the building owners and tell them things to scare them out of renting to us - things that weren't true. Pretty much people just got scared."